India’s much-touted first modern wholesale market for agricultural produce has run into trouble even before it started. The local government in charge of the project has received only one bid for it; it now plans to reword the project proposal and then invite re-bids. “We received only one bid; therefore we decided not to go ahead," said Ankur Garg, a joint secretary in the agricultural marketing department of the Chandigarh administration. Located in Sector 39 of Chandigarh, the 50-acre modern terminal market was suppose to be a showcase project in a country where fresh wholesale markets are nothing but hundreds of tiny shops in crammed lanes. An executive at one of the companies that was shortlisted, but decided not to go ahead with its bid, said the “model" drawn up by the government for the project was not “economically viable." The executive did not want either himself or his company to be identified. Subodh Shisnodia of DCM Shriram Consolidated Ltd said the company stayed away from bidding as the project was a “costly business proposition." Another executive at one of the shortlisted firms that did not bid said the Chandigarh administration was asking Rs8 crore a year as licence fee, which was “very high". This executive, too, did not want either himself or his company to be identified. Garg said the administration would make “suitable changes" in the project proposal before inviting re-bids from companies early next month. “We will take certain steps to address their (private companies’) concerns," Garg added, but declined to give details of the changes. The wish list of the companies includes a lower licence fees, a built-own-operate model (which means a private firm is granted the right to develop, finance, design, own and operate a project) as opposed to the current build-own-transfer model (which means the private entity has to transfer the ownership to the government after a specific period of time during which it can operate the terminal), and the scrapping of an additional commission of 2% on the total value of ­transactions. Companies are interested in running such large wholesale markets for agricultural produce because they have thus far been largely barred from entering the business, and also organized or formal retail chains are slowly begining to make their presence felt in India. The entry of such chains, some run by large business houses such as Reliance Industries Ltd and the Aditya Birla group, has resulted in a growing demand for good quality agricultural ­produce. 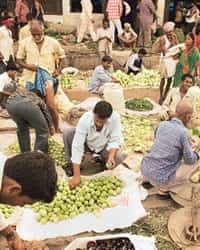 “The present marketing system, characterized by a long, fragmented supply chain, high wastages, low share of producers in price, is inadequately equipped to meet the growing needs of consumers for quality and safe (and) hygienic food," a Union government report on the terminal market initiatives said. The Union ministry of agriculture plans to attract participation by private companies in building world-class modern wholesale markets for fresh produce. Although India produces almost 10% of the world’s total fruit and vegetables, it only accounts for 1% of the global trade in these. The lack of proper storage and supply chain results in the wastage of the country’s fresh produce. The planned wholesale markets will have grading, washing, packaging, storage, cold chain, and testing and certifying facilities. They will also have electronic trading displays, banks, and even post offices and police stations. The markets will trade in fruit, vegetables, flowers, aromatics, herbs, meat and ­poultry. “In order to harness the potential of the emerging consumer demand (domestic and international), a professionally managed competitive alternate marketing structure that provides multiple choices to farmers for sale of produce along with a comprehensive solution to meet key needs of the stakeholders is necessary," the government report said.